Having taken the time to walk along to Westbrook with my camera, the source of many of our problems becomes all too obvious just by glancing at the state of the houses and hotels that lie between the Sea Bathing Hospital site and the Nayland Rock Hotel. One of the prettier ones is pictured left. Nice colour contrasts I thought. As long as so many houses and 'Hotels' in the same area remain in such a run-down condition, they will continue to attract transient residents with all the accompanying problems that go hand in hand with such a visibly run-down neighbourhood. Housing stock in this country is the oldest in Europe. We have never had this much housing this old before. Think of housing from the 1600s, there isn't a lot of it that has survived 400 years to what was built. Now think of our current housing stock, at the rate we're going thousands of homes from the 1800s will still be standing in 2250 but unless radical steps are taken now it will be by then be very high maintenance and very inefficient. The moment a suggestion goes out to pull down some housing or a hotel which has seen better days the cry goes out about greedy developers which is typical of a lot of people in the UK who 1). hate someone else making a profit when they themselves aren't (it's called envy), 2). Hate change, 3). won't do anything to improve a situation, just moan about it. That is why in places like the US the country has been succesful for the last 280 years as they don't mind others making a profit, it inspires more to try. Developers aren't greedy they are trying to make a profit to 1). fund pension funds and annuities and shares because the corporations that run these are shareholders and 2). keep people employed as they need a workforce and employment is good for the country,3). because they are a business not a charity. The real greedy people are some of the private landowners who screw developers as much as possible (because they think money is no object to a developer) pushing up land prices and therefore pushing up the property prices. Land used to cost around 20% of the Gross Development Value, it's now around 40-45%. And the US doesn't have vast areas of decrepit run-down housing in most of its major cities and towns? They may not be in the wealthier neighbourhoods, but look away from "downtown USA" and you'll find them aplenty. But they more readily accept change when some decrepit building is pulled down or radically altered to make way for something better, I'm not saying they haven't got old properties. That aside doesn't alter the fact our housing stock is very old and either radical investment needs to be made available by way of tax breaks and incentives to improve or replace dwellings or these dwellings continue to fall apart and leak wasted energy & emissions into the environment causing further global warming. Personally I see modular prefab as the way forward, building methods have not altered radically since the Assyrians and we're still gluing bricks together with goo and covering the walls with even more goo, as Kevin McCloud of Grand Designs says, you wouldn't build a highly efficient car in a field so why isn't a house built in a factory? Today's building methods will need to change. Quite a few of the houses in Westbrook are well built Victorian and it would cost less to improve and maintain than knock down and rebuild. My view is leave it to market forces unless severe dilapidation needs addressing. These Westbrook properties are the epitome of what derelict Thanet is about. There are hundreds of them if you look in the right places. 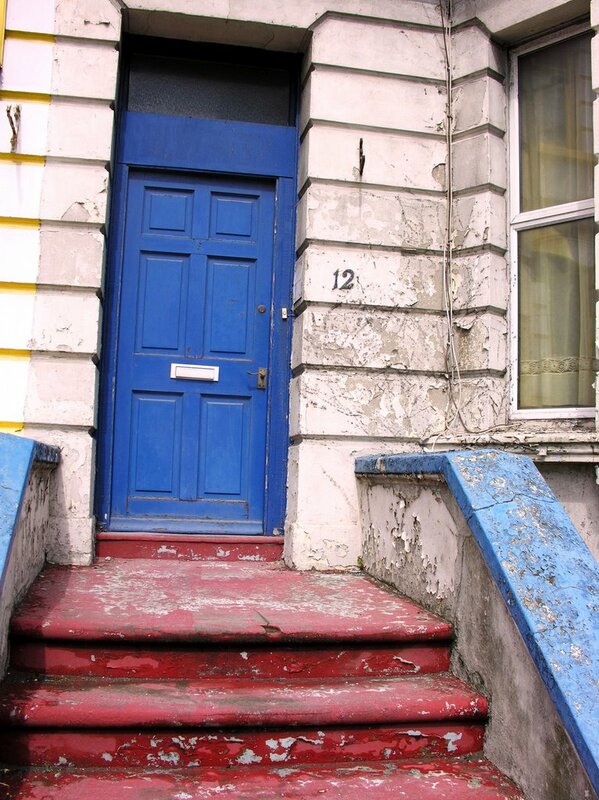 External paint doesn't cost that much, its a combination of the lazy tenant/money grabbing "Rachmanite" Landlord. The TDC should concentrate on these properties now, as they have said they would. Cliff Terrace ruin is an excellent starting point, now work left and right of this until you reach Pegwell and Minnis Bays. Then.... pat yourselves on the back for really tidying up this place. Some of these properties are being done up at the moment, there are some bad ones there, with low grade tenants. Its a bit of a vicious circle for landlords once you get a bad tenant in a block. They do a lot of damage, are disruptive and make the place dirty. Although the landlord tries to keep it nice eventually he gives up the struggle against often violent bad tenants.The other good tenants leave and only other bad tenants will rent the adjoining flats again. Then the block ends up looking like this. There are some bad letting agents in Margate as well who put very bad tenants in flats they manage, and then don't do anything to supervise them. We need to get rid of these people from our area, I don't know where they will go, a few are of local origin, others are from London or the North. I rent out my own properties and will not rent to people with obvious tatoos, hooded garments or baseball caps. I try not to rent to smokers or alcoholics and certainly won't rent to anyone if I suspect them of being a drug addict. I inspect the properties frequently and the tenants are in no doubt what my views are on dirt, rubbish and antisocial behaviour. I don't get much trouble with my tenants but I do get quite a lot with other people's tenants in neighbouring flats. Its very wearing but worth it.